The prohibition of formalities for copyright protection is the result of a historical process. Before the 1886 Berne Convention, each country had its own rules for recognition of copyright in a work. Consequently, authors had to comply with formalities on a country-by-country basis. The Berne Convention introduced the principle that authors in Union countries need only comply with the formalities imposed by the country of origin of a work. This rule was replaced in the 1908 Berlin revision of the Convention by the current principle of formality-free protection, reflected in Article 5(2) of the present Paris Act 1971, according to which the enjoyment and the exercise of copyright shall not be subject to any formality. While respecting the principles established in the Berne Convention, several Berne Union members have established voluntary national registration systems for copyright and sometimes also for related rights. In the view of these Member States, registration facilitates the exercise of copyright and related rights, by providing right owners with a simple and effective means to clearly establish authorship and/or ownership of rights. National registration and recordation systems often hold valuable information on creativity, both from a legal and economic standpoint. As an office of record, a copyright registry can make available certificates of registration, certified copies of registry documents that provide, with varying legal effect, important information on a work or other subject matter, its author or, through a documented chain of transfer, its present ownership. Registration can also help to delimit the public domain, and consequently facilitate access to creative content for which no authorization from the right owner is needed. The information contained in national registries is not only valuable in legal and economic relations but may also serve the public interest by providing a source of national statistics on creativity and culture. Finally, national registries may constitute a repository of cultural and historical heritage, as they represent collections of national creativity, including works and other creative contributions. In recent years a number of issues have been raised concerning registration of copyright and related rights in the evolving digital environment. With the advent of digital technology, the overwhelming flow of content and multiplying scores of creators , often completely unidentified, justifies a renewed interest in readily available and accurate ownership data and therefore in documentation and recordation under different forms. Some commentators have highlighted the important role that registration could play beyond its traditional functions in facilitating the exercise of rights, i.e. as a means to prove the existence of the work and/or its ownership. In this context the focus has been placed on the potential for registration to address some of the problems related to use of creative content including in regard to works in respect of which the copyright owner can not be identified or located (often termed “orphan works”) . Moreover, identification of the work or other subject matter can be complex as digital technology allows content to be recast into a variety of forms, while multimedia production combines completely different types of subject matter into a single embodiment. While there are many ways to locate a copyright owner it is clear that for countries where a registration system exists, search of registrations could play a conspicuous role in both locating the copyright owner and in assessing whether sufficient efforts have been made to that effect. The absence of voluntary national registration systems, together with the lack of communication or interaction among them, results in a highly asymmetric international scenario. Moreover, voluntary registration is very different from one country to another including systems where the work is actually deposited (registration) and others where only declarations are submitted, without deposit of the work (recordation). Some countries have expressed the need of a greater interaction among voluntary registration systems. The WIPO Committee on Development and Intellectual Property has approved, as a way to implement the WIPO Development Agenda a Thematic Project on Intellectual Property and the Public Domain, which provides inter alia for the elaboration of a Survey on Voluntary Registration and Deposit Systems under copyright. Moreover, the role of Rights Management Information (RMI) has tremendous potential for identifying and locating content. RMI is increasingly used in the networked environment, which helps users to customize their searches, find the content they are seeking, and where appropriate, enter into licensing agreements with right owners. With the support of increasingly sophisticated RMI, a number of private entities collect data on copyright status and ownership for different purposes, including collective management societies and private registries. Different approaches to the data collected and its availability are followed as some entities, such as Collective Management Organizations (CMO), collect data for their members with the objective of managing the rights entrusted to them, while others undertake data collection as a commercial operation for third parties. In some cases the task of providing a record of transactions and declarations by third parties is limited to a closed number of stakeholders or to the digital environment. As part of the Development Agenda thematic project on IP and the Public Domain a Survey of Private Copyright Documentation Systems and Practices has been prepared. This covers the use of copyright documentation, including in the form of RMI, by entities such as collective management organizations or the Creative Commons System, and would examine how these systems identify, or might contribute to identifying, content that is protected or in the public domain. The Conference on Copyright Documentation and Infrastructure was held during October 13th and 14th 2011 organized in the framework of the Development Agenda Thematic Project on Intellectual Property (IP) and the Public Domain. The goal of the conference was to raise the awareness of Member States on the linkage between copyright infrastructure and development and to highlight the complexities underlining a vast variety of key issues, including public registration and legal deposit systems, private documentation systems, online licensing tools and practices and the interrelation between copyright infrastructure and access to knowledge. During its third session held in 2009, the WIPO Committee on Development and Intellectual Property (CDIP) discussed the growing importance of the relationship between IP and the preservation of the public domain. One of the main challenges that companies, creators and Member States around the world face is determining protected materials that have passed into the public domain as well as the misappropriation of materials in the public domain or under common or community property. In the area of ​​copyright, the uncertainty about the ownership and status of specific works may cause them not to be available to the public, even if no one, nor any legal entity, claimed for himself the ownership of copyright or the rightsholder does not object to such use. Regards the works of unknown authorship or those whose owners can not be identified (“orphan works”), uncertainty can undermine the economic incentive for the creation, imposing an additional cost to users and subsequent creators wishing to incorporate new creations material from existing works. To overcome this challenge we require the development of effective tools that provide easy access to this information and checking the validity of IPRs is specially relevant. In order to address these concerns, the CDIP agreed that WIPO should undertake a series of initiatives to help Member States, particularly in developing and least developed countries, to better understand the complexity of these challenges. An increasing number of Member States have established voluntary registration and legal deposit systems for protected creative content. Those systems facilitate the exercise of copyright and related rights by providing right owners with a simple and effective means to clearly establish authorship and ownership of rights. National registration and deposit systems contain valuable information on created works, both from a legal and an economic standpoint. Registration can also help to delimit the public domain and, consequently, facilitate access to creative content for which no authorization from the right owner is needed. The information stored in national registries may also serve the public interest by providing a source of national statistics on creativity and culture. In addition, national registries and legal deposit institutions constitute valuable repositories of cultural and historical heritage, in that they represent collections of national creativity, including works and other creative contributions. Representatives of Member States will share national experiences and recent developments, highlighting the most common challenges posed by the digital environment. The [insightful] findings of the Second Survey on Voluntary Registration and Deposit Systems, conducted by WIPO in cooperation with its Member States, will also contribute to the substantive discussion in this area. Private copyright documentation, such as rights management information (RMI) and identifiers, may play a crucial role in building a digital environment in which information related to creative material is easily accessible to users. Uncertainty over the status of works and the broad diversity of rights [accessible] within different territories may constitute additional barriers to the proper licensing of content. In this scenario, identifiers can provide an essential support to the copyright infrastructure. For instance, collective management organizations (CMOs) need to build and maintain databases that contain information related to their associates and the repertoire they represent. In addition, it is also necessary to connect national databases to international projects that allow a greater level of interoperability and data exchange among different CMOs. Finally, the panel provided an analysis of some of the increasingly important private registries, pointing in particular to their specifications with regard to structure and legal effects. Accurate, automated documentation describing content and licensing conditions constitutes the basis for developing copyright-based business models in the digital environment. The digital environment also offers a multitude of different means for accessing and using creative content. As a consequence, an ever-evolving variety of content formats, business models and licenses are deployed to adapt – with increasing flexibility – to new copyright requirements. The panel also covered good examples of initiatives already under way in this area, in particular the Global Repertoire Database and the International Music Registry – a collaboration of the worldwide music sector facilitated by WIPO which aims to facilitate licensing in the digital environment by providing easier access to reliable information about musical works and sound recordings. Leading entrepreneurs from around the globe also showcased examples of successful infrastructure in the music, film and publishing industries. Open access and new licensing schemes that guarantee easier access to information and created materials are issues of increasing relevance in WIPO Committees and among other international IP fora. Tools for locating and accessing information and creative content, whether protected or in the public domain, as well as technologies for preserving digitally expressed material are among the most challenging and important areas in the field. 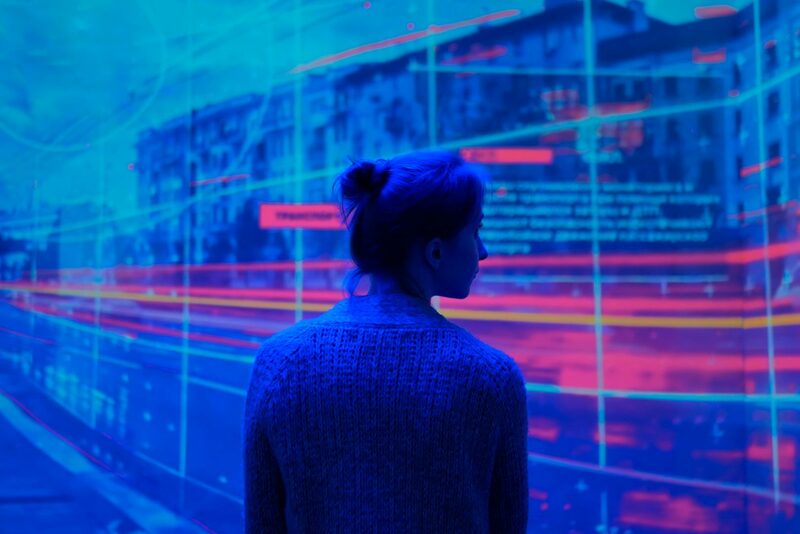 In the digital environment, technologies for registration, location and preservation of creative works are becoming essential tools for secure, rich and user-friendly access to knowledge. There is a corresponding need for governments and other stakeholders to better understand the role of copyright in relation to those technological developments. Infrastructure may also be considered a strategic asset by policymakers in addressing issues like orphan works and the public domain. Safe Creative was invited by the World Organization of Intellectual Property to the Conference on Copyright Documentation and Infrastructure held in Geneva on 13th and 14th of October 2011 to discuss private registrations, its vision of interoperability and the early challenges that we face at the dawn of the digital age. The entity participated in the conference as a case of best practice around the topic II: Private Registries and documentation: Collective management and documentation, private registration, and copyright information management. (Thursday, 13th October 2011, 15.40-17.30 hrs. ), And related their experience and ideas about the need for online private registrations to help solve some of the challenges that authors face today and will face morning. Safe Creative is the largest copyright registration which operates globally through the Internet. As of August 2014 has over 130,000 entries of authors from more than 50 countries. 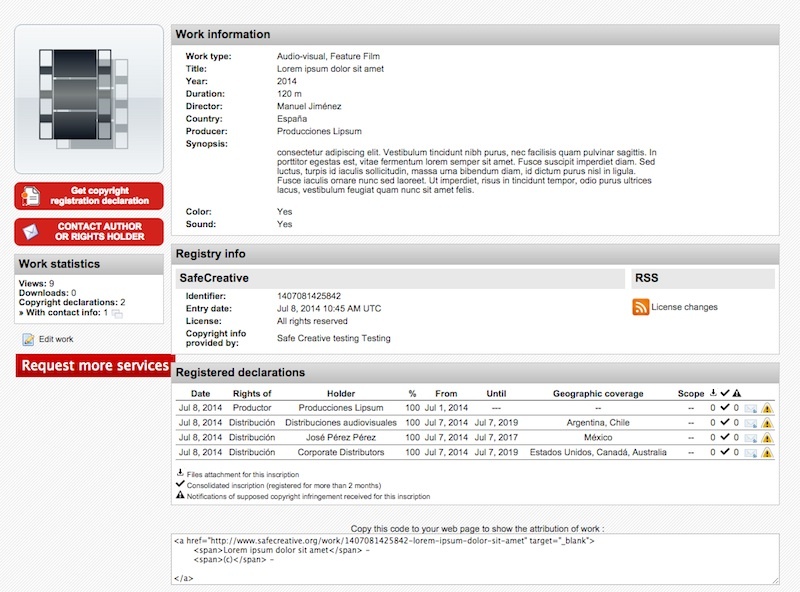 The evidence for the presumption of ownership of copyrights provided is particularly solid to ensure the identity and integrity of the work by calculating three digital fingerprints for the file containing it (MD5, SHA1 and SHA512) and employing two timestamps to certainly establish the date and time of registration: Safe Creative’s own one, plus a second, independent of Safe Creative and approved by the Spanish Ministry of Industry. The access to the information recorded on Safe Creative generates a simple and pragmatic system of trust, self-regulated by the producers and distributors. A transparent 360º information system, to provide security during the operating of distribution or exhibition of works, thus the buyer being able to contrast copyright ownership of the seller. • The producer registers the information of the film and her or his production rights. Thereafter,rights holders, will be informed of further records of other specific and related rights made for that work by third parties, so that if any claim is not correct they will be able to deny authorization issuing a copyright incidence over it. • Holders of distribution rights and related rights enroll them, and thereafter also will be informed of subsequent entries, which in turn may also state incidences if those were not authorized. The access to the information recorded by all participants in the production and distribution of the work creates a framework of trust based on transparency and self-regulation. Titles have been introduced to facilitate understanding.